After our short flight from New Orleans to Houston, my friend Elisabeth and I took a cab to the newly opened SpringHill Suites Houston Downtown. The conference was from Oct 14-16, and I booked this hotel in May because it was the closest one available (a twelve minute walk to the convention center). Last year, the conference was in Phoenix, and there were many hotels a stone’s throw away from the convention center. My friend Barbara wasn’t sold on this hotel – she wanted something even closer. But she was too busy to look into hotels on her own time. So I ended up booking three rooms at this hotel, but I made sure our reservation was free cancellation just in case something better showed up. Of course, the months flew by and October was upon us. And we were very happy that we had booked rooms in advance, while everyone around us was scrambling around at the last minute. And I was happy, because all three rooms were under my Marriott account which was registered with Marriott’s MegaBonus promotion. I didn’t have high expectations for the hotel, but it turned out to be an awesome choice. I had originally booked three King Bed Suite rooms, but Barbara had called just days before to request her room have two beds. 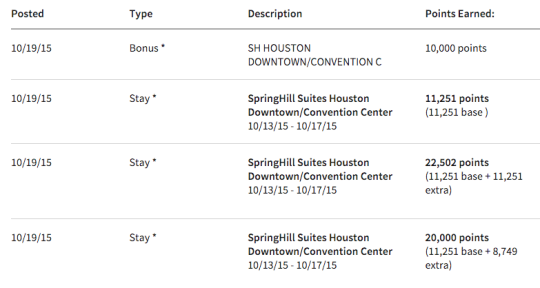 They ended up applying that change to all rooms in the reservation, so we all ended up with Double Queen Suites. The rooms very new and spacious. My room had a living area with sofa bed and TV, a bedroom area with two queen beds and another TV, and a clean and bright bathroom. I particularly liked the color palette of wood with blues, greens, and whites. 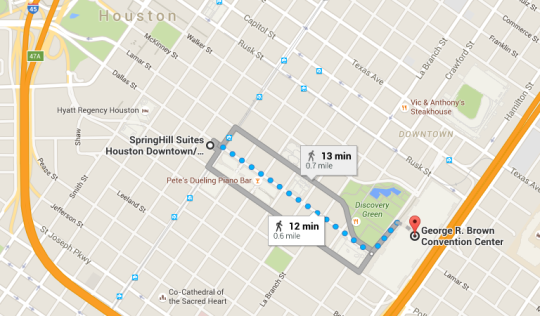 It turns out that 12 minutes is a sweet spot when it comes to distance to the convention center. Though the Hilton is attached to the convention center, it was extremely loud and crowded. As we walked towards the conference, we noticed every Starbucks in the morning had a longer line the closer it was to the conference. Luckily, our hotel had a Starbucks downstairs and the line was always of reasonable length. I tried to book this hotel for next year’s conference, but it’s all booked up. I assume that the conference reserved blocks of rooms at all the nearby hotels. Hopefully space opens up soon!